Backing up Drupal website content can be a tricky task, unless specialized backup software, like Handy Backup, used for backing up CMS. Handy Backup allows Drupal backup through FTP connections, as well as via FTPS or SFTP, to securely copy all your website content. How Frequently You Will Need to Back Up Drupal? These two types of Drupal backup operations have drastically different frequency of occurring, and require completely different approaches to scheduling. You will need to save copies of your data after any logical period of data renovation. For most active websites, this period is roughly a workday. Dynamic websites with thousands of simultaneous online operations require much more frequent backup, perhaps on hours or minutes. This operation can be viewed as “extreme” circumstances and often you do not need to schedule it; saving website content for migrating purposes can be made manually when the time comes. Nonetheless, you can schedule it or just use the last full backup to backup and migrate Drupal. To back up Drupal content, different instruments exist. All these instruments are much more difficult to learn and use than Handy Backup. For matters of convenience, we will describe some of these tools. Using SSH. This practice allows backing up Drupal but requires high skills in both SSH and Drupal. Compared to Handy Backup, allowing backing up Drupal with just one of data source options, this method is too complex to daily use. Operating via drush. The drush utility works with Drupal in most fresh versions for CMS running under Linux. This method is good when meeting these requirements, although it is impossible to implement for Windows servers and CMS versions. Backup through Drupal Backup and Migrate module. Very difficult way for true IT pros, besides security issues emerging on a regular basis with this module. It is a “default” way of migrating Drupal content to another server, but not for daily backups. 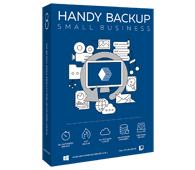 To back up and migrate your Drupal CMS, you need to use the Handy Backup Small Server edition. Free 30-days trial version! To save all the information from your Drupal CMS, please do the sequence of actions according to the following instruction. This sequence is universal, so it has no changes when you plan to perform Drupal 7 backup of files instead of previous job with Drupal 6, where you backed up databases. Start Handy Backup. Create a new task by pressing Ctrl+N, selecting a “New task…” menu option or by clicking a button on the top management panel. 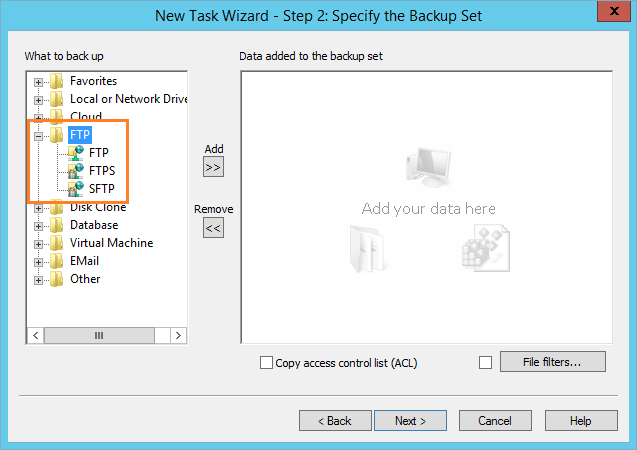 Then choose a backup task. On the Step 2, select FTP, SFTP or FTPS as your connection option for Drupal CMS, according to your connection settings. Select the “New configuration…” item and double-click on it. In the window appearing, set up your Drupal connection parameters, then test the connection. Press “OK” and then continue creating your task. Note: If you are planning to backup Drupal with some database, create a new data source from the particular database engine you are using on the Step 2. Detailed instructions about database backup you can read in the User Manual. On the Step 3, Handy Backup allows you to select your desired data destination among many storage options available. Choose the storage for backups and continue. Then you can choose the backup type and set up versioned backup. On the next step, select compression and/or encryption options if you need for it (we recommend to encrypt your files). Step 6 allows you scheduling your task. The frequency for backup tasks was discussed above. Select the desired period to start your Drupal backup automatically. Note: You can copy a fresh CMS backup task to another, and then edit it in aspects of scheduling and backup type, for simple transformation of full backup task to more frequent incremental, differential or mixed backup operation. Any edition of Handy Backup can save data from your Drupal environment. You can fully automate and schedule backup tasks, according to your Drupal management rules. Try to save your Drupal data with Handy Backup just now, downloading the 30-days free trial version!